When I was a kid, I loved stories about "girls with spirit." I liked to think that in real life, these characters and I would be friends and get up to all kinds of not-too-dangerous mischief. Some of these girls' stories ended while they were still children, so I've outgrown them. 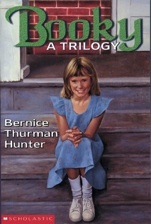 Others, though, like Bernice Thurman Hunter's Booky, grew up in the stories and, in a lot of ways, I'm only now catching up to them age-wise. It's strange to think that I'm now the age (or older) of the grown-up versions of some of my childhood heroines, but I suppose that's just how it works when they're on the page and you carry the book with you. 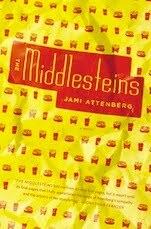 There are actually three Booky books – That Scatterbrain Booky, With Love from Booky, and As Ever, Booky – and they follow the titular character through her misadventures growing up in Depression-era Toronto. Hunter based the Booky stories on her own childhood, and the books are filled with photos of her and her family, which gives the story a kind of historical depth and context I didn't really appreciate as a young reader. What I did appreciate, though, was the way Hunter's writing opens up an era that her readers have probably learned about, but obviously never experienced. And, because the stories focus on a child (who ages as the trilogy progresses), the kinds of details you get are different than those that show up in text books or in TV shows and movies. One scene from the books that has always stuck with me is about Booky and her mum going to buy new shoes. There's a big sale and the family really has no money, so when Booky sees a pair of beautiful and stylish shoes, she knows she wants them (she is maybe 9 here). Anyway, the shoes don't really fit properly; they're too small and they pinch her feet, but she doesn't say anything. Of course, she can't wear them because the pain is too excruciating, which leads to a spanking (but with a belt) and her utter disappointment over having her first really pretty pair of shoes and not being able to wear them. Being just a kid, she doesn't really understand what's at stake here (the family moves a few times because they don't have the money for rent), but that sense of wanting something just out of reach is so strong. Despite her hindsight, Hunter doesn't give Booky knowledge she wouldn't have had, and the story is much better for it. Later in the series, Booky meets Lucy Maude Montgomery, who encourages her to become a writer. Of course, Booky has grown up a lot by this point and her Toronto is familiar and her concerns are more mature. But, her personality is still fresh and mischievous and her dreams seem so achievable that you can't help but hold your breath during her encounter with her idol. Reading Booky as a kid was amazing because it was like meeting a good friend through a book. She was interesting and flawed and so genuine that you couldn't help but be captivated by her. Going back to the novels now, though, is almost more exciting because it allows you to reconnect with a version of your younger self and get caught up in a story just the way you did when you were a kid. There are a lot of pieces – events, places, people – that I glossed over when I read it before that now pop out at me, too, and those extra elements act as another way for me to connect with the story. Booky is a character who got into my head when I was really young, and well over a decade later she is still in there, buying shoes that don't fit and smiling all the time.